Penguin are releasing a new Bond novel entitled “Devil May Care“. Guess who’s writing it? Yes, Sebastian Faulks. It’s released next week and it could be awesome. 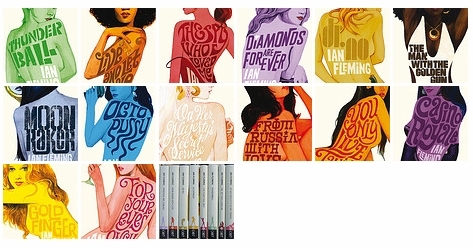 Very interesting interview with book jacket designer extraordinarire Mr Chip Kidd. My good buddies Ian and (the awesome) Jed bought me Chip Kidd’s gorgeous Book One last Christmas, it is supremely shiny. Billy G is the ‘hood! I’m looking forward to seeing him tomorrow night. Wahey! William Gibson is doing an event at the Book Festival in August. I’m booked myself a ticket already. Hopefully I can get a signed copy of Spook Country whilst I’m there. New-found friends, often as not, rented high-ceilinged rooms in crumbling townhouses, their slate rooflines fenced with rusting traceries of cast-iron, curlicues I’d only seen in Charles Addams cartoons. Everything painted a uniform dead green, like the face of a corpse in those same Addams cartoons. If you took a penknife and scraped a little of the green away, you discovered marvels: brown marble shot with paler veins, ornate bronze fixtures, carved oak. In the more stygian reaches of cellar, in such places, there were still to be found fully connected gaslight fixtures, forgotten, protruding from dank plaster like fairy pipes, each with a little flowered twist-key to stop the gas. Man, I love Gibson’s style. Read the rest of the article over at Canada’s Globe & Mail. OK, I admit it. I haven’t actually read any Vonnegut but he was on my todo list of books to read. On the way home from work last night I picked up Slaughter House 5 from our friendly local Oxfam bookshop where the emo-tastic girl who worked there greeted my purchase with “omg did you hear he just died!?”. Yes, yes I did. The SCI FI channel are making a TV version of Neal Stephenson’s awesome book The Diamond Age: Or a Young Lady’s Illustrated Primer. 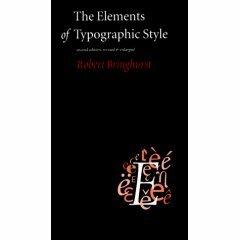 I finally got my copy of The Elements of Typographic Style by Robert Bringhurst from Amazon. As part of my new year resolutions I’m on a quest to learn something about typography. I must layout text on a web page every day at work at I’d like to know how to do it properly, and therefore improving the value of the page. After reading around on the web this book seems to be the bible and is very nicely designed and looks to be pretty readable. There’s even some chap doing an online version with Bringhurt’s typographic guidelines ‘Applied to the Web’. If you’re going to buy it online make sure you get the latest edition (3.1), which wasn’t immediately findable on amazon uk.